Sierra Club Florida News: Pass A Clean Springs Bill! Sen. Simmons (R – Seminole and Volusia) recognized these problems are unsustainable and resolved to do something about them. With the support of Sens. Dean, Hays, Montford, and Simpson, he set out to craft a bill that provides funding, sets deadlines, and addresses the impacts of over consumption of water and nutrient pollution. Since Sen. Dean is the Chairman of the Environmental Preservation and Conservation Committee, he became the natural sponsor of the bill. Sierra and many other environmental organizations have been involved with the bill since the fall of 2013. We have offered arguments and amendments, consulted and critiqued, researched rules, and participated in enough stakeholder meetings to build a picket fence around the Capitol. SB 1576 passed all of its Senate Committees unanimously and is on the Special Order calendar for a vote on the Senate floor on Wednesday, April 30. The hang up, of course, is that the House version of the bill HB 1313 - Springs by Rep. Brodeur (also of Seminole County) has not even been heard in its first committee. We need to pass SB 1576 out of the Senate and have the House take it up and pass it with no bad amendments. 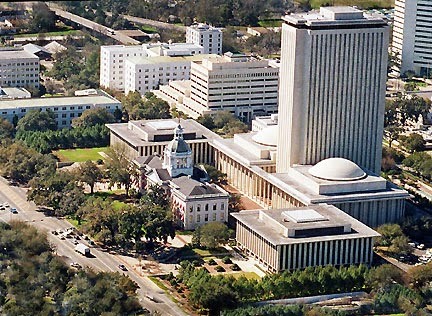 The Chamber of Commerce, Associated Industries of Florida, and the Florida Home Builders Association have been the lead opponents of the bill from its inception. And they won’t give up easily. They’ll use all their influence to get the House to gut the bill and then pretend to be environmental heroes. But we’re not going to let that happen. If the House takes up the bill it will be in front of every Representative and can’t be bottled up in committee. We will know who voted the right way for a clean bill, and who voted the wrong way to gut it… and we’ll make sure everyone is reminded in November. Please contact your Senator and your Representative and urge them to pass a clean Springs bill to clean up our Springs! The bill provides that all of Florida’s “Outstanding Florida Springs” (OFS) – all the first magnitude springs and six others - are to be assessed for adequate water flow and level and for pollution. DEP is to delineate a “spring protection and management zone” (SPAMZ) for each OFS. This is an area within a springshed where the Floridan Aquifer is vulnerable to sources of contamination or reduced levels. These SPAMZ are used throughout the bill to determine where the provisions of the bill take effect. DEP and WMDs are to set minimum flows and levels (MFLs) by 2015 – but extensions are possible all the way to 2022. DEP is also to assess all OFS for nutrient impairment and to establish total maximum daily loads (TMDLs) and basin management action plans (BMAPs) for the SPAMZ of those OFS. If a spring does not meet the MFL or it is projected that it will not meet its MFL within 20 years, the bill requires that a recovery or prevention strategy be established and that it be designed to achieve the MFL within 15 years, and also requires an annual progress report on achieving the MFL to the Governor and the Legislature. The standard for determining the acceptable nutrient load for an OFS is 0.35 mg/L Total Nitrogen. Many OFS exceed this level of nutrients by a wide margin. Jackson Blue, for example, has almost ten times the allowed amount (3.42 mg/L), and the Rainbow Springs group in Marion County is at 2.17 mg/L. When the nutrient level of an OFS is too high, DEP initiates a BMAP that determines how much pollution is coming from each source or category of nonpoint source and a plan is developed to reduce the load from each by an amount that will get the nutrient level below the standard for spring vents with in 15 years. Again, there is an annual progress report to the Governor and Legislature on whether the BMAP and the projects being used to implement it are working. Funding to help meet the costs of upgrades, BMPs, or projects to meet MFL or pollution standards will be available from appropriations made each year by the Legislature. DEP will evaluate, rank, and select projects for funding on the basis of a “worst first” / “best bang for the buck” approach. Property owners with septic tanks will not be charged for the costs of upgrades or connection costs to a sanitary sewer. If there are springs affected by withdrawals from more than one WMD, the DEP establishes the MFL by 7/1/17. At the time an MFL is established, a recovery or prevention strategy must be adopted simultaneously (if it is needed). By 7/1/17 and, if needed, recovery or prevention strategies must be adopted simultaneously with the adoption of the revised MFL. When it is determined that an OFS needs a recovery or prevention strategy, the WMD or DEP shall “expeditiously” adopt one. implementation plan to achieve adopted MFL within 15 years (with 5 and 10 year milestones). Local governments may apply for extensions of up to 5 years; local governments in rural areas of critical economic concern may apply for extensions of up to 10 years. Short title “Florida Springs and Aquifer Protection Act”; creates a new “Part VIII” of chapter 373. The bill requires DEP to delineate "springs protection and management zones" (SPAMZ) using best data available. Delineation is to be completed by 7/1/15 and maps and legal descriptions by 7/1/16. At the same time a nutrient TMDL is adopted DEP shall initiate development of a BMAP. For OFS with existing TMDLs the DEP shall initiate the /development of a BMAP by 7/1/14. If during the development of the BMAP the DEP identifies septic systems as a nonpoint source of pollution that needs addressing within a local government’s jurisdiction, it notifies the local government within 30 days, and the local government is to develop a remediation plan for inclusion in the BMAP. For OFS with an existing BMAP as of the effective date of the bill (7/1/14) a revision must be done by 7/1/17. DEP, DOH, and local governments identify OSTDS within each SPAMZ by 7/1/16 and within 60 days provide the location of the septic systems to the local government. If the local government has been notified by DEP that the OSTDS need to be addressed in one year the local governments are to develop an OSTDS remediation plan which says which systems need to be upgraded, which need to connect to sewer, and which need no further action. The plan must include a priority ranking and must be submitted to DEP for approval. Prior to submitting an OSTDS remediation plan to DEP, the local government must hold at least one public meeting for public comment on the plan. The approval of an OSTDS remediation plan by the DEP is final agency action. If a local government does not substantially comply, they may not be eligible for funding. Property owners with an OSTDS may not be required to pay any of the costs of a system inspection or for upgrading a system, or connection fees to a sanitary sewer. Whether the entities responsible for implementing the project have used their own funds for water quality or conservation within a springshed or SPAMZ of an OFS since July 2009 with preference given to those that have done so. No new OSTDS on lots of less than an acre except for passive nitrogen removing OSTDS approved by DOH. This prohibition does not go into effect until after DOH approves such systems for use. New agricultural operations that do not implement BMPs, measures necessary to achieve pollution levels established by DEP, or a groundwater monitoring plan approved by a WMD or DEP. The report must include the status of each project identified to achieve a TMDL and an MFL. If a report indicates that any of the interim 5 or 10 year milestones or the 15 year deadline will not be met, it must include specific corrective actions that will be taken to achieve them, and if necessary, executive and legislative recommendations.